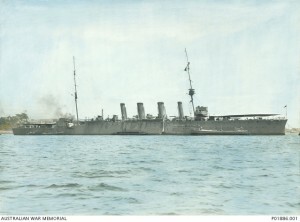 HMAS Brisbane moored in Farm Cove shortly after completion, 1915. Image courtesy Australian War Memorial. Leslie Reginald Anlezark was born in February 1889, the youngest of eleven children born to Thomas Ainsworth Anlezark and his wife Mary Jane (nee Handley). During the 1870s Leslie’s father Thomas was employed as a wheelwright by Cobb and Co. in Bourke, and it was in Bourke that Leslie’s mother, Mary Jane, died in 1894. When war was declared in August 1914 Leslie attempted to enlist, but was rejected due to defective eyesight. The following year he was one of twenty-two men who joined the Coo-ees when they arrived in Orange on Saturday, 23 October 1915. Conceived by Captain “Bill” Hitchen of Gilgandra, the Coo-ee March was a recruitment drive in response to dwindling enlistments following the heavy casualties sustained on the Gallipoli Peninsula and in the trenches of France. On 10 October 1915 Hitchen left Gilgandra with 25 men to march the 515km to Sydney, collecting recruits along the way. A total of 264 recruits reached Martin Place in Sydney at noon on Friday 12 November, where they were greeted by Prime Minister Billy Hughes and a crowd of 100,000 people. Leslie proceeded to Liverpool camp where he served as a platoon sergeant. 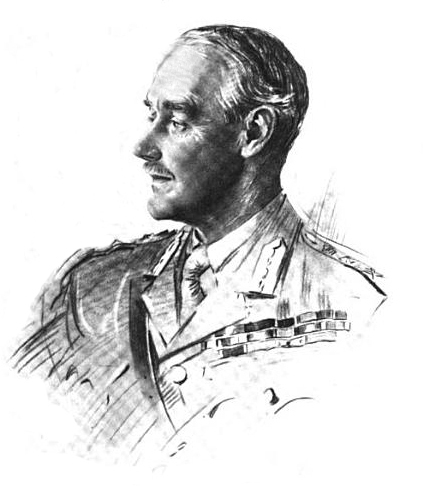 He embarked Star of England in Sydney in March 1916, disembarking in Egypt the following month. Private Anlezark served in France and Belgium. In October 1916 he wrote “a very breezy letter” to his brother Fred describing the heady excitement of life in the trenches. Leslie was hospitalised several times during his war service; during 1916 with influenza and trench foot; and the following year having sustained a gunshot wound to the right arm. In September 1917 Leslie’s father, now living in McLachlan Street, received a letter from Dr Colvin advising him that his son had been wounded and was recovering in hospital in England, where he had been visited by Sir Neville Howse. 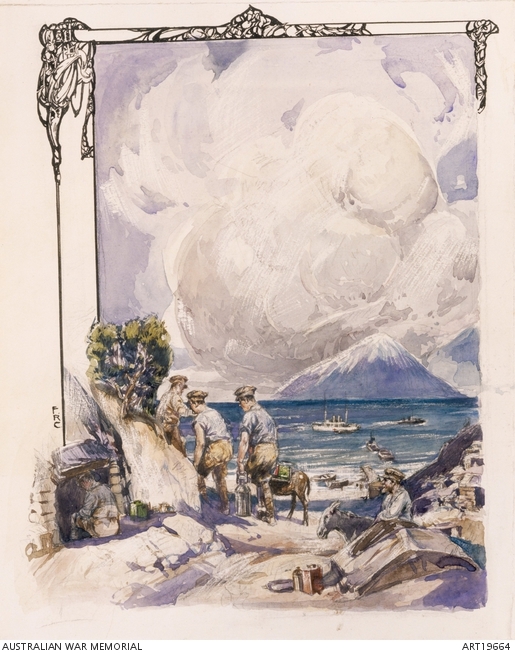 Leslie returned to Australia in May 1919. In 1923 he married Lavinia Beatrice Rogers (Rene); the couple had two daughters: Muriel and Ilma. Leslie worked at the Orange Municipal Council power house for 20 years, and then the Orange Producers Rural Co-operative, before moving to Sydney in the late 1940s. In late December 1966 Leslie and his family returned to Orange to attend the funeral of a relative. On 30 December they left Orange to return to their home in Daceyville in when their station sedan collided with a truck on the Great Western Highway at Mount Lambie. Leslie was taken to Lithgow Hospital where he died the following day from his injuries. Leslie is commemorated on the Holy Trinity Church Orange Honour Roll and the Orange East Public School Honour Roll. Lancelot Douglas Nicol enlists. Lancelot is commemorated on the Centenary of WWI in Orange Honour Roll; he would be killed in action in Belgium on 24 October 1917. Severe fighting continues in the Battle of Loos; British forces capture 3,000 men and 21 guns. The Oddfellows’ Hall hosts the “Our Soldier Boys’ Dance”. Attendees are requested to contribute tobacco or cigarettes for Orange soldiers at the front. Born in Borenore in 1895, Bernard Ambrose Coyte was the fifth of ten children born to William Henry Coyte and his wife Mary Louisa (nee Schmich). Bernard and his siblings were educated at Borenore Convent. 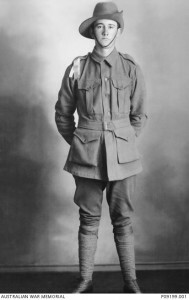 Bernard was one of twenty-two men who joined the Coo-ees when they arrived in Orange on Saturday, 23 October 1915. He was 20 years of age, although he claimed to be 21 on his attestation papers. After completing the Coo-ee march Bernard proceeded to Liverpool Camp, a private in the 15th reinforcements to the 13th Battalion. 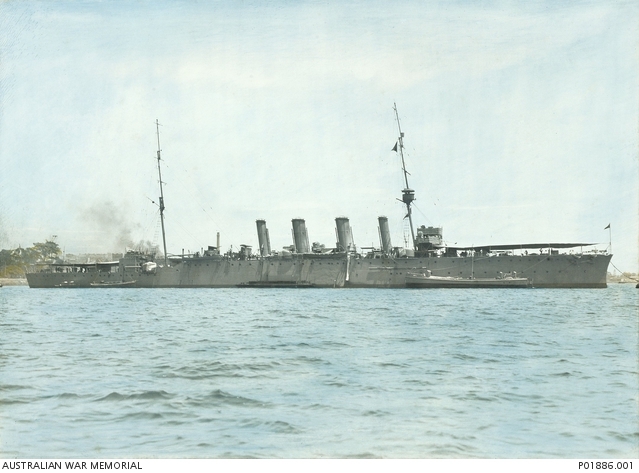 He embarked from Sydney on the Star of England on 8 March 1916, and after further training in Egypt, arrived in France for service on the Western Front. 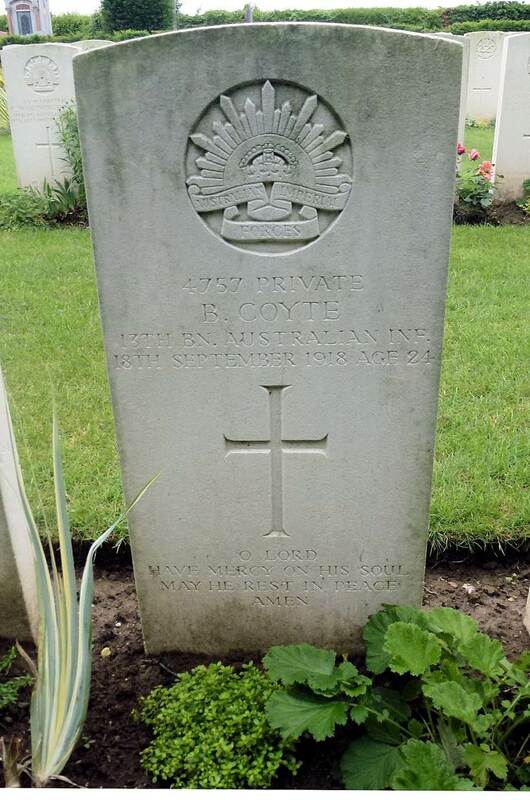 Private Coyte was hospitalised several times during his war service. In March 1917 he was admitted to the 13th Australian Field Ambulance in France, suffering from influenza and pneumonia. He was subsequently transferred to hospital in England, followed by a period of furlough. In September 1918 the 13th Battalion was engaged in battle just south of the town of Le Verguier in northern France. This battle claimed the lives of five officers and 82 enlisted men; one of whom was Bernard; he was killed in action just weeks before the Armistice was signed. He is buried at the nearby Jeancourt Communal Cemetery Extension. Bernard is commemorated on St Joseph’s Church Orange Honour Roll, the Borenore and District Honour Roll, the Borenore District War Memorial and on the World War I Roll of Honour on the southern face of the Orange Cenotaph. His name also appears on panel 68 on the Australian War Memorial First World War Roll of Honour in Canberra. In 1923 the Anzac Memorial Avenue of trees was planted along Bathurst Road to commemorate fallen WWI soldiers. A tree was planted in honour of “Pte BA Coyte”; it was donated by Borenore Retuned Soldiers. Very few of the trees are still standing today. Before going into battle in September 1918 Bernard wrote the following letter to his brother, Gabriel’s, wife, Lottie. Interestingly, it is dated 1 October 1918; apparently it was not uncommon for men to date letters this way as they went into battle. This is believed to be the last letter that Bernard wrote. Just a few lines, Lottie, in answer to your welcome letter to hand dated 9 June, was pleased to get a long letter from you and Gabe. So your little girls don’t forget me by what Gabe told me. Well I am expecting to be going to England on leave soon. I have been over here a long time and have been existing well. All the girls getting married, well good luck to them and tell your sisters that I wish them the best of luck as besides fighting hard for years and wasting the best years of my life over here but you know I have a nice little girl over here first for the time being and will close this letter wishing you and the children the best of luck. Bernard Ambrose Coyte’s headstone, Jeancourt Communal Cemetery Extension, France. Image courtesy Sharon Hesse. 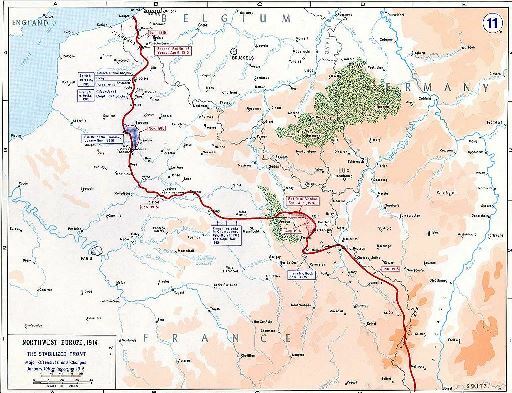 A co-ordinated Allied offensive begins in France, with French attacks in the Second Battle of Champagne and Third Battle of Artois, and British attacks at the Battle of Loos. 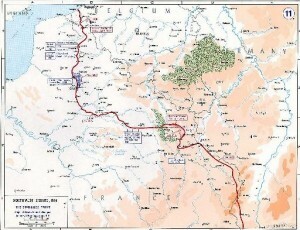 Fighting in the Allied Autumn Offensive continues until early November. Anzac Cove, 1915 by Private Frank Crozier.